SF Airlines’ inaugural flight on a Boeing 767F aircraft landed in Changi Airport today. SINGAPORE, 4 September 2018 – Changi Airport Group (CAG) today welcomed the arrival of SF Airlines’ inaugural flight from Shenzhen, China. SF Airlines is the first Chinese express airline to operate between Singapore and China, and its arrival strengthens air trade flows between the two countries. China is Changi Airport’s largest air cargo market, registering more than 270,000 tonnes of airfreight throughput (+8% year-on-year), for the 12 months ending June 2018. 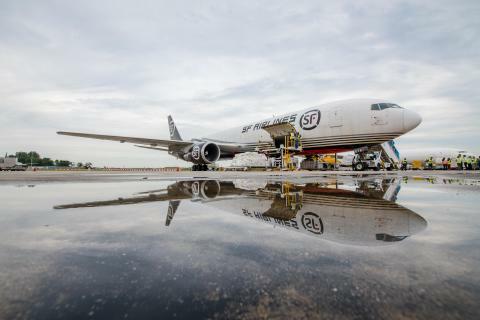 With the addition of SF Airlines’ weekly service  on a Boeing 767F aircraft, main deck airfreight capacity to and from Shenzhen will increase by about 16% on this route. The inaugural flight landed today at Changi Airport, and was welcomed by representatives from CAG and SF Airlines. Changi Airport Group’s Managing Director for Air Hub Development, Mr Lim Ching Kiat said, “We welcome SF Airlines to Changi Airport’s family of cargo airlines. Significantly, this allows for more cargo flows from China to and through Changi Airport, and will secure Singapore’s position as a premier regional cargo hub. SF Airlines is the largest express airline in China by aircraft fleet. As a member of SF Group, SF Airlines’ new Singapore services will be an extension of the Group’s business in Singapore. SF Group’s express delivery arm, SF Express, has been operating in Singapore since February 2010, and established warehousing facilities in the Changi Airfreight Centre (CAC) in September 2012. With SF Express’ growth in operations in the region, CAG has worked closely with the express player to facilitate its expansion in Singapore. As of 1 July 2018, Changi Airport is connected to 36 cities in China with more than 380 weekly services. Shenzhen is among Singapore’s top five Chinese cities for cargo throughput. The weekly service will operate from 4 September to 27 October 2018. Subsequent services are subject to approval from the regulatory authorities. UPS also operates pure freighter services on the Singapore-Shenzhen route while bellyhold capacity is provided by passenger airlines Scoot, Shenzhen Airlines and SilkAir. Changi Airport is the world's sixth busiest airport for international traffic. It served a record 62.2 million passengers from around the globe and handled 2.13 million tonnes of airfreight throughput in 2017. More than 400 retail stores and 140 F&B outlets are situated across four terminals to cater to passengers and visitors. With over 100 airlines providing connectivity to 400 cities worldwide, Changi Airport handles about 7,200 flights every week, or about one every 80 seconds.